In a recent seminar on agriculture sustainability, an old Professor of agronomy, present in the audience, commented that all what was said was correct, but that he was grown in an age where the increase of agriculture productivity was a central dogma, today, apparently, correctly sacrificed in favour of a better interaction between environment and food production. His feeling is probably motivated by robust reasons that several agronomists and geneticists, me included, share: we feel almost out of place in a cultural landscape which has forgotten promises and achievements of the green revolution, effective in nourishing a planet at a time of rapid population growth, a condition persisting still today. In 1960 the global yield of cereal grains was around 10 billions tons, while in the next 40 years it doubled. The green revolution had to do with the creation of high yielding plant varieties capable to efficiently utilize increasing agro-technical inputs. This was achieved by a rational use of genetics to recombine in single genotypes the resistance to pests, insects and abiotic stresses. In Italy, genetic and agronomic progress based on improved varieties was impressive: from 1945 to 1995 average yields increased from 0.68 to 2.57 t/ha for durum wheat, from 1.04 to 4.51 for common wheat, from 1.14 to 9.01 for maize, from 3.68 to 5.74 for rice and from 22.9 to 47.2 t/ha for sugar beet. One can ask what are the reasonings behind the adoption of new paradigms and priorities by scientists and institutions dedicated to the future of agriculture. The first consideration is that while the south of the planet still has to solve problems of true rural development, in the western societies the social implications of agriculture are part of the more general problem of finding a balance between food and feed production and care of the environment . As a consequence, the theme is debated with contributions of social scientists and politicians not familiar with agricultural specificities; as a result, their genuine good intentions frequently ignore the technical consequences of the solutions they suggest. The second point to be raised concerns our poor capacity to adopt proper parameters defining agriculture sustainability, particularly in terms of maintenance of soil fertility. On the issue, two contrasting visions have emerged. The first supports the adoption of mild systems with decreased productivity, a wildlife-friendly agriculture reducing its impact on the environment while minimizing the negative effects of fertilizers and pesticides. The second suggests more intensive agricultural systems avoiding the necessity to plogh new virgin soils which, frequently, for climatic and edaphic conditions are marginal lands hosting peculiar sources of biodiversity. In any case, a general agreement exists on the need to consider with priority the problem of future sustainability of agriculture. A possible evolution is that agriculture will remain intensive, but being based on methods and principles derived more from biology than from chemistry. Along this line of thought, new suggestions are currently emerging concerning the radical modifications of our agricultural systems . This will imply that defining a possible future should reconsider the difficulties inherent both to the practical use of the biology of the living components of agricultural processes, and to the need that such components will be properly managed in terms of sustainability. This is the core issue of this volume dedicated to the breeding of tomorrow crops. The first group of contributions introduces macro-agronomic and economic topics, related also to the comparison between industrial and subsistence agriculture. This part includes a discussion on the role and impact of genetics in support of future yield gains. The next four chapters take into account the biological-genetic components responsible for the interaction among plants and the environment: seed germination and plant nutrition; plant development; photosynthesis. Four contributions follow, grouped under the title Tools. This is the most evocative part of the volume: it illustrates the methodological revolution linking genomic resources and the capacity to predict plant phenotype and behaviour based on molecular markers; the adoption of new crops adapted to sustainable agricultural systems (one example is perennial cereal grains); molecular approaches to heterosis and apomixis; the role of epigenetics in determining the yield capacity of superior varieties. The volume ends with a chapter on quality and security of field-produced commodities and with a discussion on the state of art of the breeding of minor cereal grains. The consideration of what the volume offers, allows to anticipate, at different levels, a vision on principles, methods and conclusions on the future sustainability of food production. A first level is the attention here dedicated to reappraise relevance and role of genetics in the sustainability context. Particularly in terms of resources dedicated, the possibility of future food crises should, in fact, suggest to stress the central role of the breeding of conventional and future-tailored varieties, once the social role of this activity is recognized, as done in the past with the peace Nobel prize assigned to Norman Borlaug. A different level of discussion sees the future as interpreted in terms of targets to be assigned to plant breeding. Two cases are topical. The first regards the hybrid varieties in terms of contribution to yield increase. The adoption of hybrid crops as a final outcome of genetic selection, indeed, is becoming obligatory even for plants where autogamy does not favour an easy production of hybrid seeds. In this respect, molecular breeding, boosted by genomics, has contributed to bring again the phenomenon of heterosis to the attention to plant breeders, considering the possibility of revealing its molecular bases and of using effective prediction methods of hybrid value . The second case has to do with perennialism. Compared to annual plants, perennials reduce the need of energy and agrochemicals, as well as of soil and nitrogen losses and of irrigation water. A last consideration is proper to mitigate the impression that in the future food production may represent a problem of difficult solution. In the past plant breeders have successfully used genetics, but their approach to yield increase was essentially empirical. The incoming century, however, has already shown that varieties resistant to biotic and abiotic stresses can be developed using rational predictive methods based on molecular markers and exploiting genomics and transgenosis . More recent molecular technologies allow to generate mutations, with positive phenotypic effects, at very precise nucleotide positions in genes with a known sequence. 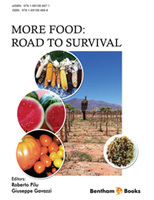 It can be concluded that the road to survival will be largely dependent on the accumulation of knowledge and on the evolution of methods capable to meet our future food needs. Salamini F. Conference delivered at the Adunanza Solenne di chiusura dell’Anno Accademico dell’Accademia Nazionale dei Lincei, 26 giugno. Wallace JG, Larsson SJ, Buckler ES. Entering the second century of maize quantitative genetics. Heredity (Edinb) 2014; 112(1): 30-8. The need for more food is rapidly increasing as the world population is growing at a fast pace. The scientific community involved in crop production and its improvement is being called upon to find solutions to the expanding global demand for crop plants and their products. Two options are available to increase yields: the first consists of an increase in the areas under production, and the second, an improvement of productivity on existing farmland. Of the two options the second seems preferable, as it avoids the disruption of existing ecosystems as well as an increase in greenhouse gas emissions. In both cases two strategies can be adopted, one classical, of extensive industrial agriculture largely adopted in developed countries to produce major crops like corn, rice, wheat and soybean and another one, known as sustainable agriculture, characterized by a production more respectful of the ecosystem. The two strategies are not mutually exclusive and which one of the two should be adopted depends on the characteristics of local production methods and on economic and political considerations, as well as the choice of global versus local food production and consumption. In this context, to really improve the situation, we should focus our efforts on the areas of the world where the nutrition of the population should be improved, like Africa, India, Bangladesh, Pakistan, China and some regions of South America. In these areas the solutions to solve the problem of hunger should be local and specific, related to the real needs of the population and respectful of local traditions. The knowledge, experience and know-how available to the western world could be invaluable tools for improving their agricultural production. Application of our model of industrial agriculture should be avoided. Only by trying to understand what are the needs of these populations and exporting our knowledge to improve their situation can we hope to contribute to solve their problems. These considerations are developed in the first two chapters of the book. The following chapter will deal with genetic variability as an essential source of plant improvement. The following chapters will analyse basic physiological processes which represent bottlenecks for productivity and the efforts that could be directed to increase the efficiency of these processes. The topics analysed will be the genetic control of seed size; germination and seedling elongation, representing crucial steps in plant development; photomorphogenesis and the effects of light on aspects related to yield, such as photoperiod and shade avoidance, photosynthesis and the sink-source flux; and mineral nutrition. These topics will be covered in chapters 5 to 9. We will concentrate on factors that are directly related to yield, omitting those indirectly affecting productivity like herbicide- and pest-resistance, drought tolerance and cold resistance. In the last part of the book, attention will be given to some of the tools available to the researcher to achieve plant improvement. We will focus attention on available tools such as molecularly assisted breeding, gene editing, domestication of new species, heterosis and apomixis. The importance of increasing productivity of the major crops to meet the demand of an expanding population is self-evident. What is not so obvious is how to achieve a significant improvement in a short time, and what tools we can rely upon to accomplish a second “green revolution”. The great majority of the contributors to the chapters of the book are teachers of advanced courses to graduate students in Biotechnology or to post-graduate students in Ph.D. programs and they feel that this book could be of interest for their students.